New technology in the book printing industry is creating opportunity for publishers to integrate their operations, distribute their books faster, and establish new revenue streams. With digital printing, the possibilities are limitless. Digital book printing allows publishers to take the pulse of the market and adjust their strategy as demand wanes or surges for individual titles. Digital printing in Newton, MA encompasses both inkjet and toner applications which makes printing faster and more profitable. It can produce high quality products that are printed at high speed for an incredibly affordable price. Digital printing has significantly improved the quality of printing and binding of printed materials, offering an incomparable combination of speed, quality, and versatility. Through digital book printing, consistent, high quality reproductions of text, photos, and graphics with exceptional professional results are achieved. With numerous options for custom printing, binding, and finishing, your next print job will be excellent. By spending less time on complex processes, you’ll get faster turnaround and the ability to run more jobs. To find out more about the advantages of digital book printing, contact Country Press, Inc. There are a lot of benefits of digital book printing. Both authors and publishers are driving a higher return on investment with more efficient printing processes through digital rather than offset printers. Using digital printing for book publishing creates numerous opportunities for authors and publishers to get their books to shelves faster for a quicker ROI. Digital printing in Newton, MA encompasses both inkjet and toner applications and offers a responsive approach that is not possible with offset printing alone. Digital book printing allows independent authors to take the pulse of the market and test the waters before printing large runs. The same goes with publishers who can adjust their strategy as demand wanes or surges for every title instead of just guessing how a book might perform in the market. To find out more about the benefits of digital book printing, contact Country Press, Inc. There are many different ways that independent authors can benefit from digital book printing. But among these benefits are the shortened time and the reduced costs. These are the main reasons that more authors and small publishing houses are choosing this mode of printing books. The digital printing in Newton, MA is aimed at producing copies of books without jeopardizing quality. The printing process of digital printers continuously improves to provide the fastest printing there is. Book quality of each copy is exceptional, text and images are printed in high definition in black and white or in color. The end product are all of the same quality, from the first to the last. Digital printing is also competitive when it comes to cost. The printing process is streamlined, unlike in off-set printing. Additionally, printing with these digital printers will not require authors to print large runs with unsure sales just for a lower cost per unit. With this efficient and economical alternative, authors can choose to print fewer copies and print more books when needed. To find out more about the benefits of digital book printing, contact the Country Press, Inc.
Digital book printing appeals to many authors today. Unlike traditional printing, digital printing avoids waste of time, labor, and money due to inaccurate forecasting and inefficient practices. The publishing industry has benefited greatly from this new approach to book production. Digital printing in Newton, MA is used by those authors who want to publish the books they have written. Authors who choose to self-publish do not necessarily choose to do so just to buck mainstream practices. Rather, authors choose to self-publish because of the many benefits that it provides them. As an author, the main goal is to get the book out to the general public faster. Traditional printing can take many months of waiting, self-publishing expedites the entire process. Digital book printing offers control over the book content and artwork. When publishing through traditional publishing houses, the author may have to compromise on many things like content and appearance. The decision the authors are involved in are limited which can affect the integrity of the book. With self-publishing, authors have full control on how the book will look. The rights and royalties belong solely to the author himself. Most important of all self-publishing offers a longer and more indefinite shelf life. With self-publishing, if the book sells it can stay on the shelves for as long as the author wishes. This gives time and opportunity for the book to be discovered by readers. To find out more about digital book printing and self-publishing, contact the Country Press, Inc.
Digital book printing offers great solutions for publishers and authors alike. 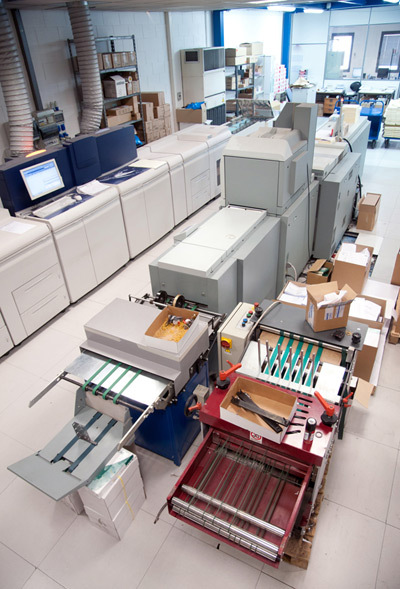 Through this printing technology, the book industry has found a way to make producing books more efficient and cost-effective. The demand for faster and better results makes digital book printing a feasible way to produce more titles while still maintaining quality. Using only top-quality, high-volume laser and inkjet printers, digital printing powerfully produces superior quality books. By turning to digital printing, an author or publishing house can choose to print only the amount of books that are needed. This is beneficial to independent authors who want to self-publish their own book. Printing a limited number of copies is much more convenient and less expensive. By doing this, many self-publishing authors are able to avoid hefty payments on initial runs. It allows them to pay only for what is needed which assures them that their investments on the printed books do no go to waste. This makes digital printing a viable method for those who are just starting to test the waters. The book industry is a competitive market, and being able to gauge whether or not an author gets into the competition during the early stages of the book is crucial. A beautifully printed book cover with crisp pages attracts book buyers. With that being said, the benefits of digital printing in Newton, MA extend to the aesthetic quality of a book as well as the commercial value. Titles that require short runs and long runs, like bestsellers, can benefit from the superb quality of digital printing. Hence, this contributes to the commercial value of the book and whether or not it will sell. With digital book printing, authors and publishers can optimize a book’s appearance, content, and value in a quick and cost-effective way. To find out more about digital book printing, contact Country Press, Inc. The cost of printing books is very expensive. This is one reason why publishers are seeking efficient and cost-effective ways to produce more titles by more authors in a more economical fashion. In fact, colleges, universities, and municipalities are also in need of a more effective solution to their printing needs. That being said, they can rely on better and more efficient printing practices such as digital book printing for their printing and publishing demands. Digital printing uses printing with digital-based images to a variety of media. Through the use of high-volume laser or ink-jet printers, a digital printer works faster with a shorter turn-around time when compared to offset printing methods. Unlike old-style printers that do not have the capability to modify images, digital printing allows for modification. And although the cost per page of digital printing is more expensive, the cost of the technical step required to make printing plates are eliminating, making this an economical choice. There is money saved because of the increased capability of digital printers to produce more in a shorter period of time. When in need of quick turn-around time on a title, digital printing in Newton, MA is the answer. Country Press, Inc. uses state-of-the-art equipment that is reliable and high-quality which produces superb print quality to help publishers, college, and municipalities with all their printing and publishing needs. Since the advent of digital book printing, it has been a viable option for book publishing. The technological advances, cost savings, and the ever-growing consumer desire for faster printing have made digital book printing a more ideal alternative in today’s competitive market. The continuously increasing demand for instant results makes digital printing a more suitable option for many authors, especially those interested in self-publishing. By choosing this process for book printing, authors can print only the books they need, when they are needed. It is more convenient and cost-effective to replenish books shelves which ensures the nonstop flow of income using digital production. Digital printing in Newton, MA is so versatile that it can also be used in conjunction with traditional off-set printing. For instance, authors can print large runs with offset printing and fill the shortfall with digital printing. The latter can also be used for the initial production while waiting for off-set lead-time. Digital book printing can also be used to test the waters while gauging demand in order to determine how many copies to print. For more details about the benefits of digital book printing, contact Country Press, Inc.
Digital book printing has changed the landscape of producing books for the better. The biggest advantage is the outstanding digital print quality along with the various paper and binding options. Advanced digital printing allows you to save on costs even when you choose to print fewer copies when first testing the waters. This means that authors and publishers only need to print the amount of copies needed without incurring a higher cost per unit. Additionally, it is easier and faster to print additional books when needed in order to replenish inventory. Digital printing is helpful to authors and publishing houses with smaller budgets, smaller demands, or for those who are unsure of the market. Digital printing in Newton, MA ensures a speedy turnaround when compared to traditional printing methods. No printing plates are needed and there is a significantly higher speed of printing; however, text and images will both be clear from the first page through the last.